Another year, another SVP! This time, we convened in Albuquerque, New Mexico. Just like in 2016, I was on the authorship of two posters presented at SVP. As before, one of these posters was about scientific outreach using the internet. My co-authors (Meig Dickson, Austin Deans, Henry Thomas, Blaire Voss, and Maya Jade McCallum) and I described our experience in running an informal online course about dinosaur paleontology earlier this year, and evaluated whether our methods of teaching were effective (spoiler alert: for most part, they were!). Meig presented our poster on the first day of the conference and will probably write up her own report about it in due course. One of the star attractions of this year's SVP was this model of Utahraptor made by TRX Dinosaurs. In the main hall of the museum, conference attendees were welcomed by a cast of the Tyrannosaurus specimen "Stan". The museum's Triassic gallery was particularly impressive, as might be expected. Here are some fossils (and a partial life restoration) of an erythrosuchid. It's quite a large animal! A block of Coelophysis specimens! A Placerias realizes it has come within striking range of a Redondasaurus. In the Jurassic hall, a Stegosaurus looks out on a confrontation between a Saurophaganax and a Diplodocus ("Seismosaurus"). Moving onward to the Cretaceous, here is a skull of Pentaceratops. I was pleased to see that museum signage correctly marked dinosaurs as having survived the K-Pg extinction (so much so that I hadn't even noticed they were using the outdated term "Tertiary"). A few live gar were on display, presumably to represent a lineage of animals that supposedly hasn't changed much since the Cretaceous. A highlight was the fact that the museum had concentrated their most impressive local fossil specimens in a temporary exhibition area. 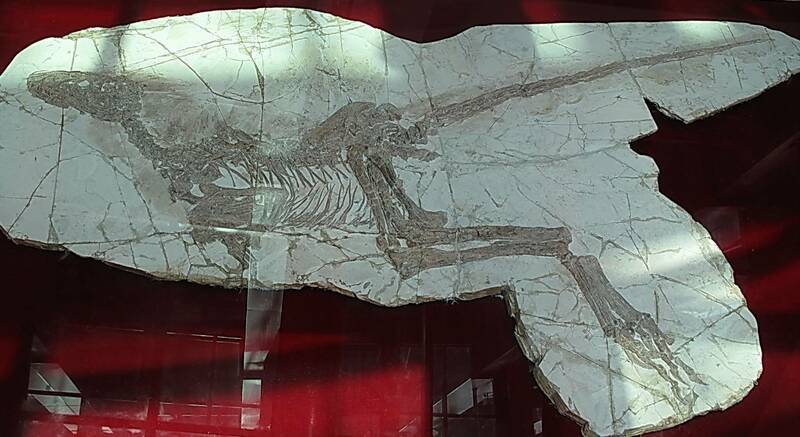 Here is a very complete specimen of the aetosaur Typothorax. A partial skull of Parasaurolophus. On the second evening of SVP, many bird paleontologists gathered together for a "bird dinner", an event that had also occurred last year and seems poised to become a new SVP tradition. There were some snags with the logistics of getting everyone to the dining venue, but it appeared that much fun was had by all who attended. I ended up sitting next to Mike Habib, who regaled everyone at the table with facts about soaring animals and tales about his experiences testifying as an expert witness for crime trials. It was also nice to have a University of Maryland reunion lunch on the third day (Friday) with my former instructors Thomas Holtz and John Merck and fellow alumni Benn Breeden, Susan Drymala, and Eugenia Gold, which hadn't been possible last year as several of us had not been in attendance. This is all I can show of my poster for now, sorry! Meig had invited several friends (myself included) to her Shabbat dinner for Friday night. This, too, ran into some logistical issues (namely that the dinner was scheduled to start before the poster session ended...), but fortunately enough food was still left by the time I made my way there. Afterward, we were all also able to return to the conference in time for the auction, so it all worked out in the end. This year's live auction theme was Doctor Who. The auction was entertaining as always, though I feel that I had a bit more fun at last year's auction by a small margin. This may have been partly because I was more familiar with last year's source material (the Guardians of the Galaxy films), but I suspect that the inclusion of a very inappropriate shirt in the preceding silent auction soured things for many attendees. Here's hoping that the discussion sparked by this kerfuffle leads to the implementation of more effective society policies moving forward. Roger Smith's talk on ecosystem collapse during the Permian mass extinction, which dropped the major bombshell that we now know of Lystrosaurus skin impressions! Unfortunately, the one talk on alvarezsaurs (apparently reporting on a new species from the Hell Creek Formation) was cancelled, which I was quite disappointed by. However, Boban Filipović's model of a Hell Creek alvarezsaurid won the 3D art category for the Lanzendorf Paleoart Prize competition, so alvarezsaurs made at least one high-profile appearance at the conference. Not only was this the biggest SVP so far, it also hosted the largest gathering of members from my Palaeo-Tumblr friend group. Individuals represented are Tristan Stock (Leaellynasaura), myself (Albertonykus), Meig Dickson (Kulindadromeus), Tyler Young (Cryolophosaurus), Bobby Ebelhar (Triceratops), John D'Angelo (Ornithopsis), Sam Stanton (Deinonychus), Henry Thomas (Zhejiangopterus), Austin Deans (Machairasaurus), and Kevin Sievers ("Diplotomodon"). Several attendees have joked that next year's SVP (which will take place in Brisbane, Australia) is likely going to be the smallest SVP to date. I, for one, would certainly like to go, but I suppose we'll see.